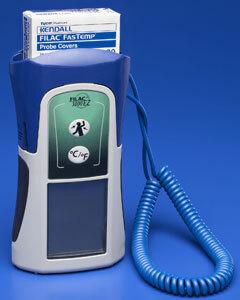 The FILAC 3000 Electronic Thermometers feature completely separate color-coded isolation chambers with individual probes, probe wells and probe cover holders. This patented system provides the benefits of electronic thermometry while at the same time reducing the risk of cross-contamination. The FILAC 3000 Electronic Thermometer's compact, robust design will stand upright on a flat surface and rubber side grips make it easy to hold. The intuitive icon based interface system with backlit LCD display is easy to read and our unique progress bar indicates status temperature measurement. The FILAC 3000 Electronic Thermometer's patented isolation chamber design, color coded probe and probe cord, and ACCUSYSTEM single use probe covers minimize the risk of cross contamination and enhance infection control measures. Our probe cover serves as an infection control barrier while also acting as a medium for heat transfer from patient to the thermometer which contributes to system accuracy.